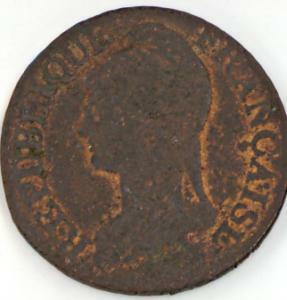 Obverse bears a profile bust of "Liberty" facing left and is inscribed around border: "REPUBLIQUE FRANCAISE". Reverse bears a wreath of oak leaves within which is legend: "CINQ CENTIMES L'AN 8". Below this are the minter's or assayer's marks and the "AA" mint mark of the Metz Mint.